(Nanowerk News) By "crumpling" to increase the surface area of graphene-gold nanostructures, researchers from the University of Illinois at Urbana-Champaign have improved the sensitivity of these materials, opening the door to novel opportunities in electronics and optical sensing applications. "I believe that this work will benefit researchers in the area of surface plasmonics by providing a new strategy/design for enhancing the surface enhanced Raman spectroscopy (SERS) detection limit," explained SungWoo Nam, an assistant professor of mechanical science and engineering at Illinois. "This mechanical self-assembly strategy will enable a new class of 3D crumpled graphene-gold (Au) nanostructures. The enhanced limit of detection will allow biomedical and environment monitoring of important molecules at high sensitivity by SERS." "This work demonstrates the unique capability of micro-to-nanoscale topographies of the crumpled graphene-Au nanoparticles--higher density, three-dimensional optically active materials--that are further enhanced by the formation of hot spots, bringing the nanoparticles closer," explained Juyoung Leem, a graduate student and first author of the study published in Nano Letters ("Mechanically Self-Assembled, Three-Dimensional Graphene–Gold Hybrid Nanostructures for Advanced Nanoplasmonic Sensors"). "We achieve a 3D crumpled graphene-Au hybrid structure by the delamination and buckling of graphene on a thermally activated, shrinking polymer substrate. This process enables precise control and optimization of the size and spacing of integrated Au nanoparticles on crumpled graphene for higher SERS enhancement." 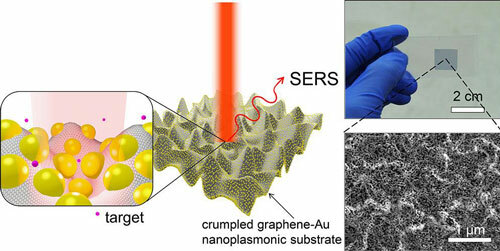 According to Nam, the 3D crumpled graphene-Au nanostructure exhibits at least one order of magnitude higher SERS detection sensitivity than that of conventional, flat graphene-Au nanoparticles. The hybrid structure is further adapted to arbitrary curvilinear structures for advanced, in situ, nonconventional, nanoplasmonic sensing applications. "One of the key advantages of our platform is its ability to shrink and adapt to complex 3D surfaces, a function that has not been previously demonstrated," Nam stated. An earlier study by Nam's research group was the first to demonstrate graphene integration onto a variety of different microstructured geometries, including pyramids, pillars, domes, inverted pyramids, and the 3D integration of gold nanoparticle/graphene hybrid structures.